The third day of the RYA Youth National Championships was disappointing said Principal Race Officer, David Campbell-James as he hoisted the flags indicating there would be no more racing today. 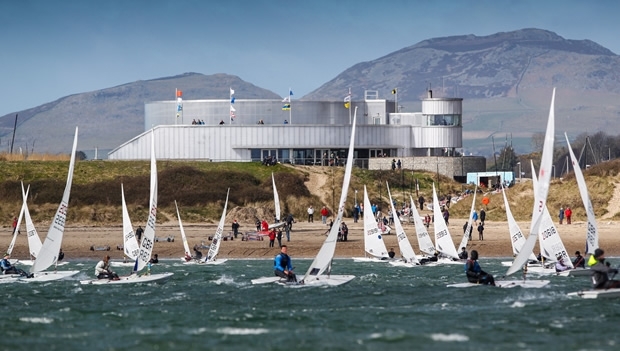 The Laser classes, RS:X and 29er gold fleet launched on time for their first race in 18-20 knots, before all classes except the RS:X were sent back in as the average wind speed increased to over 25 knots. James Hatcher won the only race of the day, current leader Andy Brown (Largs SC) finished third but maintains his lead by just a point over Hatcher. Rounding off the top three is Matthew Carey who finished fourth in today’s race. “We were really hoping to get some racing in before the wind got up,” said Campbell-James. “We launched the boats at 10 for an 11 start. The wind was in the 16-20 knot area with a few gusts above that but not really too bad, it stayed like that for quite a long time then at 11 the wind went up to 22 then 28 knots, with gusts of 35. “We now have AP over A flying as the wind is forecast to go up for the rest of the day and not drop before 6pm tonight. It’s disappointing for us, however the RS:X class did manage one race, the race officers did a great job to get that race in but overall it is very disappointing. “Tomorrow, the forecast is looking a bit the same, so the pressure is on for the race officers,” concluded Campbell-James.